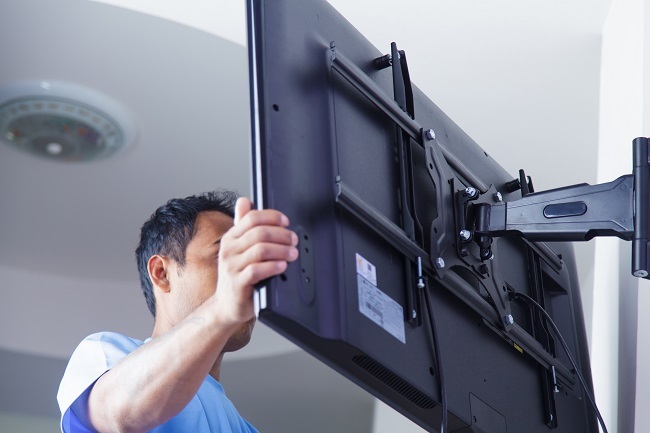 Install a mounting device that holds the television away from the wall and protects the base of your television. New televisions are often too thin to contain all of the space and ventilation needed to ward off damage from proximity to a fireplace, so you’ll need a wall mount that does all of that and more. Look for extending arms that hold the television away from the wall itself; while the air can still conduct heat, it’s far better than the warmed wall itself. Also look for arms that can change the television’s direction: if the television is about the fireplace, that means you probably have windows on the opposite wall, and moveable mounts can change the screen’s angle to keep the glare away. Get a projector instead of a television. This removes the mix of heat and electronics from the equation entirely. While you will have a screen above the fireplace still, it won’t be as easily damaged by the heat and you can automate it to roll up into a protective case when it’s not in use. The projector and all of the fragile electronic components will be safely away from the fireplace, either on the ceiling or the top of the opposite wall, so you don’t have to worry about potential damage or the screw marks from the wall mount if you rearrange the room. No matter which option you pick, Audio Video Solutions can help. Go to our site here to get started.